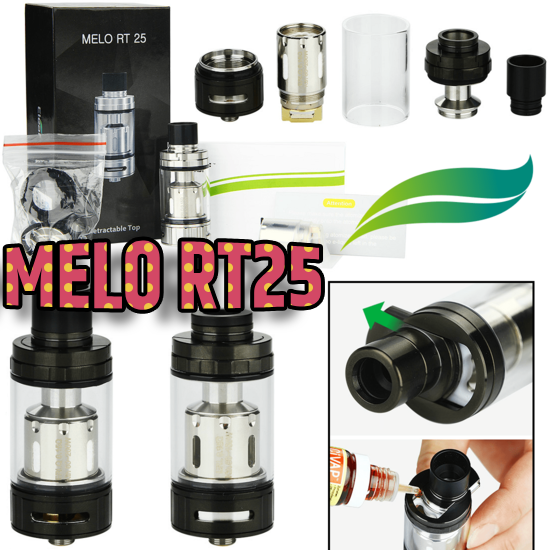 ELEAF MELO RT25...ELEAF MELO RT25...ELEAF MELO RT25!!! One of our go-to atties of all time right here...the Eleaf Melo RT25 is one of the most solid tank atomizers out there. SHARE US ON SOCIAL MEDIA AND GET MORE CHANCES TO WIN! The winner of the lottery #1175 for ELEAF MELO RT25...ELEAF MELO RT25...ELEAF MELO RT25!!! was angie cox from Hull, United Kingdom on Feb 9, 2019. The Eleaf MELO RT sub ohm tank atomizer features a retractable top (RT) fill solution which makes e-liquid refilling the easiest and most convenient ever. The ERL series coil heads are skillfully designed for ultra high power, enabling a huge amount of vapor production. The wide bore drip tip sits perfectly on the tank with a large diameter of 25mm. Airflow can easily be adjusted by turning the control ring with knurled design. In short, it's a great piece of vapegear! SHARE US ON SOCIAL MEDIA AND GET MORE CHANCES TO WIN!